I always pick up my emails when travelling and so it was that earlier this month whilst I was in London I replied to an email from a Gomarbella reader. Back on the Costa del Sol the very next day, I missed the midday Malaga airport bus to Marbella bus station by minutes and rather than hang around for the next bus I decided to check out the advice I had just given to John and catch the train to Fuengirola train station and check out how far the Los Boliches stop is from the Yaramar Hotel and then take the bus home to Marbella from the Fuengirola bus station which is right next to the Fuengirola train station. It was a great train ride from Malaga airport to Fuengirola, a sunny day with cheerful piped music in the carriages. Los Boliches is the second last stop before pulling in to the underground train station and I was able to write again to John before he left the UK to come to Spain. I was lucky with my connections and it worked out that by taking the train to Fuengirola from Malaga airport and then the bus to Marbella I got home about 15 minutes faster than if I had waited for the next bus from the airport to Marbella bus station. I had fun on the way home too! Got any questions about traveling on the Costa del Sol? Write to me on the blog page and I’ll do my best to help you. To contact me please click on the tiny comment label below for help. Remember to tick the box which says “Email me any posts” so that my reply will be emailed to you automatically. Nobody sees your email address. It’s a great system to beat the spammers. Please give me a first name to reply to even if you make it up! Write to me now if I can help you with any travel hints on the Costa del Sol or elsewhere in Spain. PS: The elevated Los Boliches train stop is completely accessible to all travellers especially wheelchair users. Hi Tracy, thank you for writing in. Yes, good thinking, I would do the same thing. Here are the timings of departures from the Airport, arrival times at Fuengirola and journey times. I think the cost is €3.60 each. You can get tickets from the ticket office or a machine at the station. Hello Kim, thank you for your kind words. From Malaga airport you can get to Elviria in two ways; 1) Airport bus from Malaga airport to Marbella and then a taxi from Marbella bus station to the hotel Las Chapas Palacio del Sol. Bus around €8 and taxi €20. 2) By train from Malaga airport to Fuengirola train station (three trains every hour) then taxi to the hotel Las Chapas Palacio del Sol. Train approximately €5 and taxi around €30. For comfort I would choose the Option 1. If you have to wait more than an hour for the airport bus then take Option 2! Going back to the airport, definitely Option 2. Taxi then train. The taxi will take 30 minutes and the train journey from Fuengirola train station to Malaga airport will take 43 minutes. After several days to check for transport from Malaga to / from various destinations. It's only now I've seen wonderful helpful page for transport from Malaga to Marbella and other places that are also effective. BY TRAIN AND BUS !! THANK YOU! I'm going to Costa Del Sol the 29.july 2015. Hope you can answer me as fast as you can. Malaga airport to Elviria (Las Chapas Palacio del Sol Hotel). Replacing residence from Elvira to Los Boliches. And repatriation Los Boliches Malaga airstrip (how long will this trip take). Hi there, why don't you try Aparthotel Ronda 4? I have never stayed there but went in a few years ago to ask for information and the staff were very helpful. It's very close to Los Boliches train station. Why don't you try Aparthotel Ronda 4 and use it as a base for your first visit and while you are here check out other possibilities for the next time. I hope this helps you. I'm travelling to Los Boliches in October and looking for ccomodation recommendations if you have any, I have tried tripadvisor but the jsut give Fuengirola as a reference point and as i have never been I don't know what is near to Los Boliches. Absolutely Robyn, it's train all the way to Los Boliches for less than €5 one way (2013). Don't take a taxi from the airport, take the train. There are three trains every hour. Me and a friend are travelling to spain in april next year, I was just wondering – is there a direct train from Malaga airport to los boliches? as a few taxi posts ive seen say their really expensive! Hello Tyler, thank you very much for your contact. Have a look the Los Boliches Station page. It will take you 10 minutes to walk from the Los Boliches train stop to the train station and the Fuengirola bus station is one block towards the sea from the train station. If of course you would like to travel by train, then it's only four minutes down the line! By the time you have climbed the steps to the train station, bought your tickets, waited for the train (three trains every hour) travelled, walked out of the train station, it will have been quicker to walk. 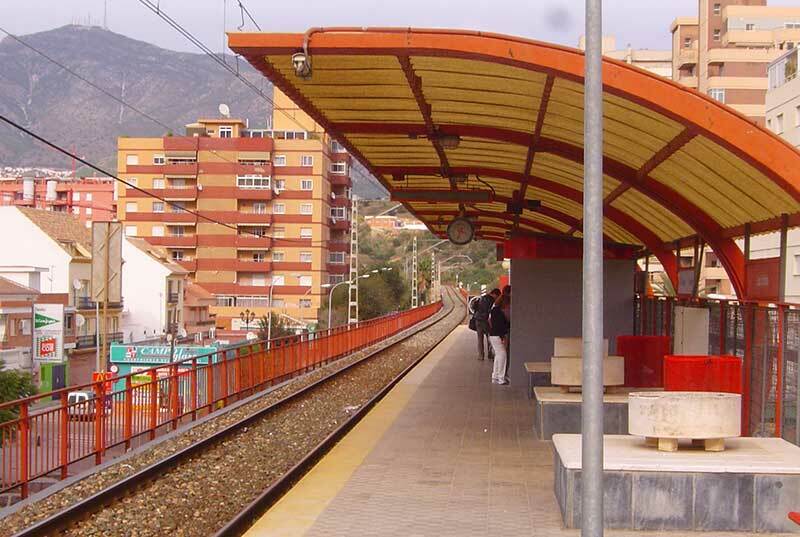 Google – Fuengirola train station – and you'll see how close the bus station is to the train station. Hi Mike – you have an amazing set of websites. I just Liked gomarbella on Facebook. We are arriving in Fuengirola in a week from Istanbul. I appreciate all your detailed directions, but what I can't find are exact locations of train and bus stations. For instance, we're getting off at Los Boliches. But if we want to later take a bus to Marbella or farther west, we would pick this up at the main station, yes? I booked at the Hotel Las Palmeras in Fuengirola, I intend to take the train from Malaga airport, but I do not know if I have to stop at the station fuengirola or station los boliches? Hi Mike, I am arriving in Malaga airport at 21.30 Sunday 15th May and need to get to my sister's apartment near the Don Carlos in Elviria. Budget is tight so what would be the cheapest options? There will be two of us with carry-on bags only, having finally mastered the art of travelling light. The return trip will be to catch an 11am flight on Wed 25th May. Any advice appreciated. PS: I'm familiar with the area around Elviria. Hi Sheena, you can make it to Grangefield Oasis for less than €10 from Malaga airport per person! Take the train from Malaga airport to Fuengirola, there are three trains every hour. The fare will be about €3. From Fuengirola train station walk one block to the bus station and take the bus to Marbella. There are 2 buses every hour. When you buy your ticket at the bus station ask for Riviera del Sol. That's where you'll get off. It should be about €2.50 or less. When you get off at the Riviera del Sol bus stop, take a taxi up to Grangefield Oasis resort. If it costs €8 one way, then that's only €2 per person. Job done as in less than €10 one way (2012 prices). Here’s a link to help you find more information about getting from the Riviera del Sol bus stop up to the resort. About dancing, there's a lot going on in the resort, there's also Calahonda urbanisation which is easy walking distance right next to Riviera del Sol. To go further away as in back to Fuengirola or down the coast to Marbella or Puerto Banus, get glammed up and bus it one way, then budget to take a taxi back. You can also do what the Spanish girls do, take the last bus out and then come back on one of the first buses in the morning. Sleep it off and then do the whole thing again the next night…. Sheena you'll get more up to date information from reception about good places to go than from me! You can easily walk down to the beach, (I like walking) if your shoes are comfortable and it's not too hot. When you are coming back up to the resort in the heat of the afternoon, you may prefer to take a taxi from next to the bus stop you'll get off at. When you head back to Malaga airport, you'll find your bus stop on the sea side of the road, bus back to Fuengirola and then take the train. Also I'm just wondering if you could tell me is there any good places nearby for going out dancing and drinking near the hotel or would we need to go to marbella? Hi Ferdinand, thank you for your kind words, I am always pleased to know the site is helpful to visitors to the Costa del Sol. To get down to Algeciras to catch the ferry you can check timings and book your ticket comfortably in advance on the Gomarbella online bus ticket booking service. Don't bother to book your ferry in advance unless you travel in summer, just walk from the Algeciras bus station to the port and buy your ferry ticket to Ceuta at either of the two ferry company offices. From across the border at Ceuta you can share a taxi to Tetouan and pick up the public transport network to travel anywhere in Morocco. Marrakesh is well worth visiting. I like Essaouira on the Atlantic coast and from there you can work your way back up past Casablanca and Rabat and back to Tangier to get back to Algeciras. From Algeciras, Tarifa just through the straits of Gibraltar is well worth hanging out at. You can get a local bus there. Back in Algeciras I would bus around the bay of Algeciras to the La Linea bus station on the border of Gibraltar and spend a night in Gibraltar. Miss out Estepona and San Pedro de Alcantará on this trip and have a look at Marbella and Puerto Banus. Miss out Fuengirola this time and spend a day or so in Malaga city when you are heading back to Malaga airport. Inland if you have time, Ronda is a great little city and if you have time, go on from the Ronda bus station to visit Sevilla to get a feel of an inland Andalusian city. You can do all of this comfortably on public transport. There is an excellent train system from Fuengirola to Malaga to vary the bus travel. Ferdinand, I hope this gives you some sort of framework, if you get bored or need ideas, get to an internet cafe and write to me! I've just got back from doing the Camino de Santiago on a bike from France across to Santiago de Compostela then another five days on the Via de la Plata from Sevilla to Santiago de Compostela so I still have itchy feet! I'm at amazed at your extensive knowledge of the network, and feel you should be recognised for your kind contribution. You are completely correct in your thinking and planning, it will depend in the end on the airport bus timing. Train + bus, you can do the whole journey for less than €10 and under two hours. Adventurous and you see how the other travelling half live. Bus to Marbella and taxi to Las Chapas, probably about €26, 6 for the bus and 20 for the taxi. More expensive but more comfortable. Why not make your decision when you get to Malaga and you are walking out of baggage retrieval and you look at your watch. Again as I say, your assessment is right on! Have a great time and I'd like to know what happens. My journey by bike is 870 kms and I guess I'll be thinking on my feet a lot of the time! Will you let me know what you decide? Thanks! This really helps! Probably you are in a hurry now, but maybe you read this before the 11th of May, one more question, isn't it faster to take a direct bus to Marbella and take a taxi from the bus station in Marbella to Las Chapas? (Or is the bus station in Fuengirola closer to Las Chapas than the bus station in Marbella?) Do you know what it approximately costs to take a taxi? Hi there, thank you very much for checking into Gomarbella and your kind words. I'm replying in haste but you'll find more info about getting to Las Chapas on this same blog if you scroll down and look at the conversation I had with Kate. Basically take the train from Malaga airport to Fuengirola, bring a 5, 10 or 20 euro note to pay, although the fare is less than 5 euros. There are 3 trains every hour so no need to run from the airport. When you come up from the train station in Fuengirola, walk one block towards the sea and you'll be at the Fuengirola bus station. Take the first bus to Marbella, there are two every hour, buy your ticket from the little window next to the buses. You can Google or also search in the Gomarbella search box on this page: – list of bus stops between Marbella and Fuengirola – look through the bus stops for the Elviria bus stop which is where you will get off. PS keep an eye on your possessions while on the move, we are going through hard times here..
Amazing your service! Hopefully you can help me as well. I land on Malaga airport 11 May 14.15h and need to go to Las Chapas (Marbella). Could you please inform me what is the best (fastest) way to get there (which bus/train I should take)? Dear Grangefield Oasis visitor, I forgot to answer the first part of you question! Take the train from Malaga airport to Fuengirola then take the bus to Marbella from the bus station which is right next door to the train station. Three trains every hour from Malaga airport to Fuengirola and two buses every hour to Marbella from Fuengirola bus station. Hi there, I'll copy in a link which will give you all the information you need to get to Grangefield Oasis. Getting up and down the coast is easy. Use the bus from the main road below Grangefield to travel towards Marbella, Puerto Banus and Gibraltar. To travel the other way Malaga and Malaga airport, I would use the bus from the Riviera del Sol bus stop to get to Fuengirola and then change to the Fuengirola train station which is only 5 minutes walk from the bus station and take the train from there. SEVILLE.- Pickup in Marbella or San Pedro 65 euros. Tours leave Wednesdays and Fridays. CORDOBA.- Pickup in Marbella or San Pedro 65 euros. Tours leave Thursdays. GRANADA.- Pickup in Marbella or San Pedro 65 euros Tours leave Tuesdays, Wednesdays and Fridays. There are lots of possible combinations. If your sixth member is arriving or leaving from Malaga airport before 11pm, he could take the airport bus to Marbella bus station where you could meet him. Malaga airport really starts at the Marbella bus station and it's less than five euros each way. He could then rent a car locally in Marbella for the days that you need the extra vehicle or do the tours above as an organised excursion. If the sixth member of the group is staying only for a short while then a small rental car from Malaga airport for three or four days would cost less than the price of three excursions and you could put an extra member into the second car for the trips away from the coast. As with all holidays, it depends on how mobile you all want to be, how much the drivers want to be driving and who wants to go on which tours. Maybe not all the family will want to go on all the tours! Does that help you Michelle? Please write back with any questions if I can help. Hi Michelle, thank you very much for writing in all the way from Texas and also for Gomarbella on Facebook. I'm checking right now to see what might have happened. I looked on the Gomarbella car rental search engine and a 5 seater automatic Toyota Yaris (or similar sized car) comes up at €617.19 for 14 days which works out at €45 per day. With your departure time of 7am in the morning at the end of the holiday, if you didn't have a hire car it would mean using two taxis to get back to the airport, (they only carry 4 passengers) costing approximately €65 each (2011) so straight off you can offset €120 against the cost of the car rental or your overall holiday costs. I've just emailed our friendly travel agent Leo at Viajes Valemar to find out the cost of organised excursions to Sevilla, Ronda and Cordoba. I was thinking that to save the cost renting another car, when there are six of you, one if not two of you could travel to the same destination on the coach, whilst the others went by car. As soon as Leo lets me know, I'll post the information here (and also send it to you by message on Facebook to make sure). There is a pick up point for the three excursions I mentioned above almost at the end of Calle Las Gardenias where you are staying. Ronda would be a very easy excursion to do if three or four of you travelled by car and the others went by public transport. The bus station is in San Pedro de Alcantará just along the road from where you are staying and the journey takes the same time by car or by bus. The road is mountainous and winding, it's very safe, but the driver needs to concentrate so anyone who wants to sit back and enjoy the views might want to go by bus! Tarifa just beyond Gibraltar is a must. Perhaps you can do that on a five seater day because it's not so easy to reach by bus. The Atlantic beaches are fantastic, there are great beach bars for lunch, every kind of windsurfing and enormous dunes for the children. It's a tremendous place to spend the day. It's my favourite place on the coast. About the temperatures, July is normally the warmest month of the year and so far, it has been warming up quite as normal. I haven't read of any extremes to be expected. It should be the usual warm month. Today it's overcast and a little muggy. The air can be a little humid on the coast but When you are inland in Cordoba, Granada or Seville, it's a different heat, hotter but dry. I always put a bottle of water into our visitors' hands when we pick them up from the airport so they get into the habit of keeping hydrated and it'll be good to do the same with the children. I hope this helps Michelle, I'll let you know when I get the excursion prices and hopefully it will help calculate costs and the usefulness, or not, of getting an extra hire car. Thanks very much for writing in. You are absolutely right about taking the airport bus to Marbella. That fare is still just under €5 but it does fluctuate slightly. The taxi fare from Marbella bus station to the Don Carlos area after 10pm on a Sunday will be around €20. If you are feeling relaxed and your journey has gone well and you are not in a hurry, from Marbella bu station, you could also get on the Marbella to Fuengirola bus service, there are two every hour. The last bus out will leave at 23:00 and you could get off at the Elviria bus stop. Make that decision when you get to Marbella! Going back to the UK, you could do the same journey in reverse, or for a bit of variety, take the bus to Fuengirola from where you got off earlier and then the train from Fuengirola train station which is only one block from the bus terminus in Fuengirola. Both bus and train run two services every hour so you won't be waiting around anywhere long. The train fare is still less than €5. I hope that helps you Philip, best wishes from Marbella and thanks again for your contact. Hi Mike, hope you can help. I'm looking for the cheapest way to get from Malaga airport to Elviria. I arrive late on Sun 15th May, around 21.30. There will be two of us, travelling light (carry-on bags), and I can walk from Don Carlos Hotel to my sister's apartment. I was thinking of taking the Airport-Marbella bus and a taxi from Marbella to Elviria, but don't know the fares. Any info appreciated. I phoned the Centro Comercial Malaga Nostrum and spoke to a girl in Gerencia (Management) and said that there isn't a taxi rank in the Centre but if you come to her office – Gerencia – on the ground floor of the big shop Factory, she will gladly phone for a taxi. It's a really big building and is easy to find. The main Centro Comercial Malaga Nostrum telephone number is: Tel: + 34 952 244 005. I'm sure that whatever shop you are shopping in will also ring for a taxi for you. By the way, she didn't know where the Guadalhorce train stop was but had the feeling that it wasn't very near. My favourite shop in Malaga Nostrum is the big Do It Yourself shop Bauhaus! They have a great coffee shop too. My wife prefers the clothes shops. Please let me know how your journey goes. but from nustrom can i found taxi easily ? That's a good idea although I didn't suggest it at first for the reason below. I searched just now for the street address of the Guadalhorce train stop but couldn't find it so I have just written to Renfe to ask them for that information. I was in the Poligono Guadalhorce about six weeks ago looking for parts for my car and the road going past the Malaga Nostrum had been dug up and there were traffic diversions in place and it wasn't a comfortable place to walk. You would certainly not want to be walking around in the Poligono (Industrial Area) after dark. Let´s see how quickly Renfe answer me and I will let you know as soon as I hear from them. Hopefully they will write back today. How soon are you thinking of going? if i take the train from fuengirola to guadalhorce, and then i take a taxi, can i walk to get there, is it possible ? The Centro Comercial Malaga Nostrum is a great shopping centre but not that easy to get to without a car. Take the train from Fuengirola train station (or Los Boliches) to Malaga airport and then take a taxi from outside the Malaga airport train stop to the Malaga Nostrum shopping centre. It will be a minimum fare, about €6 because it is just over the Guadalhorce river from the airport. You could walk but it would take you about 30 minutes to get there. Take a taxi back to the airport and then the train back to Fuengirola. If you don't need to go to that shopping centre especially then stay on the train all the way to the last stop on the Malaga line and you have got the Larios shopping centre about 10 minutes walk from the station. Hi, thanks very much for checking in to Gomarbella. I phoned the Hotel Las Palmeras to check which stop is closer, Fuengirola Train Station or Los Boliches. The receptionist suggested that you get off at Fuengirola train station, the last stop on the line. From Fuengirola train station to Hotel Las Palmeras it's about a 10 minute walk. Los Boliches train stop is about 15 minutes from the hotel. There is not really much difference between the two. Perhaps one day during your holiday if you catch the train for an outing to Malaga city, walk along the Paseo Maritimo until you are opposite Los Boliches train stop, you can just see it from the Paseo Maritimo and take the train there for a change of scenery. By train, Los Boliches is exactly four minutes from Fuengirola if I remember correctly. I hope you have a great stay, the weather is fantastic at the moment. I booked at the Hotel Las Palmeras in Fuengirola, I intend to take the train from Malaga airport, but I do not know if I have to stop at the station fuengirola or the station los boliches? Do I spend my whole life dropping my wife off at Malaga Airport T3? Well I was there again this morning, she was on her way to Cork with Aer Lingus travelling with my daughter and our two grandchildren and I looked over at the transport interchange mentioned above and it is still not finished and there is nobody working on it. Perhaps it will be ready for the summer of 2011! Regarding the comment above, I meant to say that the transport interchange has NOT started as at the beginning of April 2010. I was looking at it yesterday when I dropped my wife off at the new T3 and I am sure it will be ready for the summer of 2010. Until then, passengers will use the old train stop. Hi and thanks for your contact. Yes, as at the beginning of April 2010 the new transport interchange has kicked off and the old Malaga airport train stop is still being used. It is well sign posted from T1, T2 and T3. Los Boliches is actually the last stop before Fuengirola train station. Depending on where your hotel or apartment is, it may be quicker to get off there or if you need Fuengirola centre, stay on the train for four minutes more and get off in Fuengirola which is the last stop on the line from Malaga airport. Hope that helps, the weather is brilliant right now. I am arriving at Malaga Airport at 21:00 on April 16 2010. Is the airport to Fuengirola train accessible from the airport now? I think I get off at Los Boliches for Fuengirola. Is this correct? Thank you very much for your kind words. Yes, you can buy tickets online for the Malaga to Marbella bus but you will need to google – ctsa portillo – and then follow the links to the Avanza bus online booking facility. If you are taking the airport bus to Marbella during the winter months, there shouldn't be a need to book in advance, you would just buy your tickets on the bus at the aiport. As it gets nearer the summmer, hopefully if tourism picks up, it would be advisable. If you do pay in cash on the bus, then try to use a small note, such as 10 or 20 euros and check your change as you get it. Often it is such a relief to get on the bus that you stuff the change into your pocket and it is too late to do anything later if it is wrong. Let me know if you have any difficulties in booking. You have a terrific blog. I have a quick question regarding the purchase of bus tickets from Malaga to Marbella. It looks like those tickets need to be purchased on the bus. Can this be done with a credit card? We're trying to avoid carrying around lots of cash if possible. Thanks very much for writing in. That's a great time of the day to arrive at Malaga airport, you are not in a hurry and can enjoy the rest of the trip to Los Amigos Beach Club. Take the train from the airport to Fuengirola, there are two trains every hour. If you type – train timetable – into the search box up at the top of this page on the right, it will give you the times of all the trains between the train station at Malaga airport and Fuengirola train station. The journey take 43 minutes exactly. Just one block away from the train station is the Fuengirola bus station. Type into the box above – bus stops between Fuengirola and Marbella – and you will get a list of all the bus stops and the timetable also of buses leaving Fuengirola bus station to go to Marbella. You will see there are two buses every hour. You will do the whole trip there for less than 10 euros each. I hope that helps you Shaz, have a great trip. The weather is absolutely brilliant right now for late October, sunny and warm. Hi Seamus, thanks very much for your kind words and also for using gomarbella. I checked via email with a friendly Marbella taxi driver who said that he would be willing to collect your family from the airport in his taxi but he didn’t know what other taxi drivers would do. You can interpret that the way you want to but it seems like a big saving over two taxis. If you write to me on the contact form over on the website http://www.gomarbella.com I will give you details of the driver and the fare. I agree about getting the family into bed as early as possible. On the way back a taxi to Fuengirola train station then the train could be a pleasant family adventure, but not on your arrival evening. I hope to hear from you on the contact form Seamus, thanks again for your contact. hello there Lots of very useful info on this blogg, I am staying at the grangefield oasis club in a few weeks time, I have 3 kids 1 teenager and 2 toddlers plus my wife, we were looking at getting a taxi transfer on arrival however, I noticed that taxi’s only seem to take 4 people, Will the taxi driver allow me to hold my 2 year old on my knee or will we have to get 2 taxi’s. 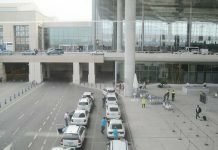 Are there 8 seater taxi’s at the airport? or should we pre-book a transfer. I will look at the taxi/train thing on my way back but as our flight doesnt arrive until 8.50pm, I would prefer to get the kids to the hotel and fed in as stress free and timely manner as possible after a 2 hour flight and a 2 hour drive before that, the last thing they will want will be another 2 changes in transportation mode. I hope you got my earlier reply suggesting that you go to Algeciras. It is on the Estacion Benaojan Montejacque blog that you first wrote to. Here is what I said ” Thank you very much for writing in to the gomarbella blog. It looks like you have planned the journey carefully aready. The bus station in Los Barrios is some way from the train station and I think I would go all the way to Algeciras, it’s a port city with all sorts of shipping in the bay. You could check out the ferry terminal just over the road from the bus station just in case you do a trip to Morocco the next time you come down. You could then look for a cafeteria to have a coffee and roll before making your way to the station. Take a bag with some fruit and sandwiches and a drink for the train, all the Spanish passengers eat as they go. Watch out for your belongings getting on and off the bus and the train and especially when buying your tickets. As I said it is a port city so it has its share of dodgy people and opportunists. Have a great trip Maria and keep your camera handy. Please let me know how it goes if you have time. Having read your recommendation, I feel enthusiastic about the unique train track between Algeciras and Ronda I would like very much to do this trip. We will travel from Torremolinos by bus and taking the 7:50 which I expect to get to Algeciras at 10:30. The train to Ronda leaves at 12:15; we have less than 2 hours which would to spend exploring the area. Should we get off at Los Barrios and explore the area instead of Algeciras? Does the bus stop in San Roque near the station? Should we spend the time there? You are very welcome. I hope you have a great stay and thank you for writing back. On the way up to Malaga airport yesterday I checked out the La Colina stop and also drove down the Hotel Sol Don Pablo from there to check it out. There are no taxis at all at the La Colina train stop. When I got down to the Hotel Sol Don Pablo I chatted to one of the taxi drivers outside and he told me the same. Anyone arriving there and needing a taxi would need to phone the Radio Taxis Torremolinos company on 952 38 06 00 and they would send the nearest taxi. The answer to your question though came from the very pleasant receptionist at the Hotel Sol Don Pablo, Juan Fernández I think it was, who said you should get off at the main Torremolinos train stop which is actually closer to the hotel. It’s the next train stop after La Colina coming from the airport and there are always taxis outside. The fare from there to the hotel would be a minimum fare of around €7. Yes, Google located the hotel correctly. The footpath access to the hotel from the beach is off the end of Calle Guadazaón but the actual road entrance where the taxi will drop you off is Calle Bajondillo running parallel to the Paseo Marítimo. Laura I hope that answers your questions. I am going to add some information to the blog under the name of Hotel Sol Don Pablo in case it is of use to other travellers. It looks like a great holiday complex and I was impressed with the treatment I was given by two different receptionist and the security guard who was tracking me around! Thank you very much for your kind words. I’m very glad that you find gomarbella useful. I checked out the La Colina area and here’s a link to the La Colina train stop. Thank you very much also for using the Gomarbella Travel Pages! I have booked accommodation for three of us in Hotel Sol Don Pablo, having read your advice to others I intend to take the train from the airport. Am I correct in getting off at La Colina (La Collina)? Is there a need for a Taxi? Will I find one out side? Is the hotel in Calle Rio Gaudazaon (off Paseo Maritimo) where I can see it on Google Maps Satellite View? Thanks for getting back to me about the train. Sounds like a good option. You could get the 21.34 train out of the airport if your plane got in early and your luggage came off first but that never happens so you still have the 22.04, the 21.34 and the 23.04 which is the last train of the day out of the airport to Fuengirola. So I would definitely keep the train in as an option. I’ll ask Carolina who is one of my travel agent students to check on how far the Ronda IV is from the Los Boliches station. She´ll contact them tomorrow and I’ll let you know. Thanks very much for using gomarbella Kev and I look forward to getting back into contact. I am bringing a party of 12 out on Fri 24th April and wondered if you could advise me the best way to transfer them all to Fuengirola. We are staying at the Ronda IV Apartments in Los Boliches. We won’t be landing at Malaga til 2120 so wondered if the train is still an option and how far Los Boliches train station is from Ronda IV. Thanks very much for writing in. That’s an interesting bit of research needed. I’m sure my travel agent students will be able to help. Let’s see what they can come up with. I’ll do my best to answer you at the end of the coming week, hope that’ll be OK. I think we will go with the suggestion of the Torreblanca train stop. I have checked the location for the train station on multi map and it is right behind the hotel. Will there be a taxi rank there or will the hotel call a taxi if we ask them to ? I will remember to bear in mind your warnings about personal security and the pickpockets. I am really looking forward to it now.It will be so much more of an adventure taking the train. Will we be able to keep our luggage with us on the train ? Thanks for that Owen, it’s always nice to get thanks or feedback. Thanks very much for getting back to me and a Hapy New Year to you as well keep up the good work. Thanks for writing back and Happy New Year to you. I phoned the Crown Resort Marbella and the receptionist confirmed that it is the Sitio de Calahonda bus stop where you need to get off. If you google “list of bus stops between Marbella and Fuengirola” you will get my list of bus stops and you will find the Sitio de Calahonda bus stop halfway down. The receptionist told me it is about 500 metres up the road. It takes 5 minutes to walk and probably about 10 minutes pulling a suitcase. The phone number of Crown Club Marbella is 00 34 93 36 74 and the girl was very pleasant and spoke good English, I should have asked her name. I teach English to hotel receptionists so I was interested to see how she answered. I hope that helps you and don’t hesitate to ask any more questions. The weather is cold but sunny at the moment on the coast. Hi Owen, thanks for writing back. I am sure I have got directions to Crown Club Marbella also, just got to lay my hands on the information. Brilliant day today, I was out picking olives in the hills off the coast and it was warm and sunny. Give me a couple of days to reply. My computer is going in for an upgrade so I will be out of touch temporarily. Thanks for the info. It is the Crown Club Marbella that I am going to. It is situated in the Calahonda township. I think that the Regency palms is close to it. Thanks for waiting for my suggestions. br/>Then click on the link “Bus stops between Fuengirola and Marbella.” Then click on the Riviera del Sol bus stop link. I am assuming you are going to the Crowne Club Riviera resort? Near the bottom of the Riviera bus stop page, you will find a link to my blog and if you scroll down to the comments, halfway down all the comments you will find a dialogue with Sarah who was travelling to the Crowne Club Riviera Resort. All the answers you need to get to this resort will be in this section of the information. Owen, if you are going to one of the other Crowne Club resorts, let me know and I will find that information for you. I have got a fairly complete answer for you somewhere on how to get from the Fuengirola train station to Crowne Club Marbella. I’ll find it and pass it on to you via the blog. I am pleased to see you plan your holidays well in advance. Best wishes from a very sunny and warm Costa del Sol. I am intending to travel to Crowne Club Marbella on the 11th Feb 2009. I intend to get the train to Fuengirola then a bus if possible. Can you advise where to get off and how far is the club from the bus stop. I phoned the Ronda IV hotel in Fuengirola 00 34 952 660 716 and asked about the cost of a taxi from the Fuengirola train station to the hotel and the receptionist said around 6 euros. She said you could also get off the train at the Torreblanca train stop. 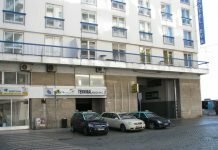 Next to this stop is the Torreblanca hotel and you can get a taxi there. The Torreblanca train stop is the second last one before the Fuengirola train station. Check here for information about trains from Malaga airport train station to Fuengirola. It will give you information about how to find the train station and also the schedule. About the buses from Fuengirola to Mijas have a look at buses from Fuengirola to Mijas Pueblo. Fee I hope you have a great holiday. The weather is very nice at the moment. Warm and sunny! Thanks very much for writing in to gomarbella. It will certainly be a lot cheaper to travel by train to Fuengirola. I can’t remember exactly where the Ronda IV is but I’ll phone them in the morning and find out the taxi fare from the train station to the hotel. About the bus from Fuengirola to Mijas, yes there is a bus service connecting the two towns and I’ll also send you the link to the bus timetable. I’ll be back in touch. Im hoping you can help. I am visiting fuengirola with my husband and mother in law in two weeks time and am considering whether to get the train from malaga airport rather than a taxi as we have done in the past. Can you advise if this will be an easy straight forward option and if we will have far to walk from the train station in fuengirola to our hotel ? Just in case we do decide to be lazy and opt for the taxi do you have an approximate for the cost of the fare as it is a couple of years since we were last in fuengirola and I cant remember how much we paid then. We are staying at the Ronda IV. Also is it possible to get a bus from Fuengirola to Mijas ? I am thinking of having a day out there. Hello again Freya, I’m back home now. Your question about whether it is better to train to Fuengirola and then bus to Calahonda compared with the airport bus to Marbella and then bussing back to Calahonda is a very good one but really you won’t save much time or money one way or the other so I would go for the train to Fuengirola. I am giving you a link to look at; It gives advice on how to get to a particular hotel in Calahonda. You will see that this hotel is just a bit too far from the A7 (CN 340) to easily pull a suitcase, so I suggested using a taxi from Fuengirola to arrive at the hotel and then using the bus after that to get up and down the coast. On this page you will find a link to the timings of all the buses from Fuengirola travelling towards Marbella and also a list of the bus stops between the two towns so you will know exactly where to get off! There is also a picture showing how close the Fuengirola bus station is to the train station. There are slightly fewer buses on a Sunday but quite enough to allow you to travel freely. If you tell me the name of your hotel I can check it out to see if it is within easy walking distance of the main road. Let me know how I can help with any other information. Best wishes for a great holiday on the Costa del Sol Freya. The weather is lovely and warm at the moment. Thanks for writing in to gomarbella. I’m in Bordeaux right now, just checking my emails before I drive back to Marbella so I will answer your questions on Saturday or Sunday with pleasure. I have just put my wife on the train to Paris at 5.35 in the morning so that was an interesting experience! I look forward to answering your questions very shortly. You really seem to know your stuff about transport in the Malaga area so I just wondered if you could help me out. Me and my boyfriend are staying at a hotel in Sitio de Calahonda near Mijas. I can’t work out whether it’d be cheaper and easier to get the airport bus from Malaga to Marbella then a bus from Marbella to Sitio de Calahonda. Or whether to get the train from the airport to Fuengirola and a bus from Fuengirola to Sitio de Calahonda. Is the bus station in Fuengirola close to the train station? Oh and if you happen to know, do you know where abouts the Fuengirola to Marbella bus stops in Sitio de Calahonda, because I don’t know how I’ll know to get off the bus or get to the Hotel?! Also we arrive on a Monday but leave on a Sunday, will we have problems with public transport on a Sunday? Thanks for writing in. You are absolutely right with your ideas about getting to Santa Maria Golf in Elviria. Take the Malaga airport to Marbella bus station shuttle service. From the Marbella bus station take a taxi from the rank outside, it will cost around 12/13 euros I would estimate. Effectively the shuttle bus will bring you to Marbella on the toll road which runs inland and then the taxi will take you about 8 kms back in the direction you have just come but on the very busy A7 coastal road. The bus service I have mentioned is a really good and cost effective way to get to Marbella. I am just trying to find out right now if there is a bus strike coming up this week by the Portillo bus company who operate that service. As soon as I know I will put up details on the page I have given you above. Best wishes for your visit Ray and I hope the golf is good. Hello Sarah heading for Grangefield Oasis Club. When I went into Reception I got a very nice welcome from Inma the receptionist on duty. She was one of my receptionist students three years ago in the government hotel training school in Marbella where I do some teaching so I told her about you coming to stay at the complex. Please identify yourself and say hello to her from me when you get there. She let me look around the complex and it looks great. There is a a mini supermarket in the Oasis Club for essentials. Inma told me that a taxi from Grangefield Oasis Club down to the main road costs 6 euros each way and from Oasis Club to Fuengirola or from Fuengirola bus or train station to Oasis Club the taxi trip will cost 15 euros. I hope that helps you with your budgeting. I took some photos of the Riviera del Sol bus stops and will do a page in a day or so which will help other travellers to that area. Hello Sarah, thanks very much for your kind comments. Friends of ours from Oz stayed in Oasis Club a couple of summers ago and when we went to visit them we were very impressed with the complex. You will be doing things in style when you get up there! It’s a very attractive resort with lovely gardens and pools. You could easily stay up there and never leave the pool. The only downside from the point of view of bus travel is that it is just out of comfortable walking distance because it is uphill from the main road especially when you are arriving for the first time and carrying backpacks. When you have sorted yourselves out, it would be an easy walk down in the cool of the morning to catch the coastal buses in either direction. Then you could walk up in the cool of the evening. When you arrive, what about taking the train from Malaga train station to Fuengirola train station which is the last stop on that line? It’s a great service, three trains every hour and really cheap. Then from Fuengirola train station take a taxi to Oasis, the taxi rank is right outside the train station. You could then use buses for your travel up and down the coast and for places further away Ronda or Granada, or not so easy to reach from the Costa del Sol like Tarifa, hire a car for two or three days in a row only which would save some money. There are great shops and supermarkets and restaurants right at the bottom of the hill so you won’t run short of food. If you can wait a day or so I can get the cost of the taxi from the Fuengirola bus company, from Fuengirola train station to the Oasis complex. I hope your trip across Europe is going well. Doesn’t it make a difference using the euro in different countries? Look after all your possessions and each other. Hello! I can’t believe how helpful your blog is. I have a question for you as well. I will be arriving in Malaga via train (from Madrid). From here I wish to go to the Oasis Club which is north of Calahonda. I am a poor student backpacking across Europe, so my hope is to use the bus to arrive at this location. Is this possible? If not what is the cheapest alternative? I will be traveling with my boyfriend so the total cost will be split between two. Would it be worth it to splurge and rent a car as to have access to nearby cities? Thank you so much! Thanks for using the gomarbella Costa del Sol bus pages. Yes there is a bus from Estepona stopping at Fuengirola and one that goes in the other direction also. Both buses call in at the Marbella bus station on their journeys. The train station is an easy block’s walk from the the bus station. I hope this helps, best wishes from Marbella and thank again for writing in. Could you advise if there is a bus that goes from Estepona stopping at Fuengirola (and also Fuengirola – Estepona?) If so what bus would this be. Also could you advise where the train station is in Fuengirola in comparison to the bus station? Kate I went out to check this afternoon. The bus stop before Pinogolf is actually closer to Las Chapas hotel and is the Elviria bus stop. You can see the top floors of the hotel on the other side of the road peeping out from the tops of the pine trees. If you look at the page with all the bus stops, you will see the URL above, I have added this information to the page. 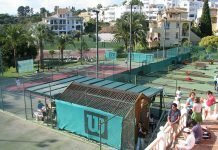 You would get off at the Elviria bus stop, then walk over the road bridge right next to it and then continue along the other side of the road for about 100 metres to the Las Chapas hotel. There is a shopping centre between the road bridge and the hotel. Kate is is an easy walk without a suitcase but if it is hot and you are tired from travelling and you just want to get into the pool with a cold beer, then I would get a taxi from the Marbella bus station to the hotel for the first time. I have just phoned the Marbella taxi company and the girl told me that a taxi from the Marbella bus station to the Las Chapas hotel during the day will be 15.20 euros. To catch a bus into Marbella, the bus stop you would use is just below the road bridge on the hotel side of the road. When you come back you will get off on the other side as I have said. So for travelling up and down the coast by bus the hotel is very well located. But I suggest you do it the first time by taxi. With what you save on the bus from Malaga airport to the Marbella bus station, (4.03 euros) you can treat yourself to a taxi ride. I hope this helps and that you have a great stay. The weather is hot and it’s fantastic weather for the pool or beach. Hello Kate, thanks for your good wishes about the football. Yes, it was a great day for Spain. This morning everyone was walking around looking very pleased with themselves. About the bus stop for the Las Chapas hotel, the bus stop you will need to get off at is the Pinogolf stop. Then you would walk back towards Marbella, take the pedestrian footbridge over the road which you will see in the picture if you click through on the Pinogolf bus stop link. Continue walking back towards Marbella and you will come to the Las Chapas Hotel. From this page you will also find the timetable of buses on the Marbella to Fuengirola route, this is the bus you will need to take. Kate I am driving out in that direction tomorrow and will check this information, I must have been past a million times without fixing it exactly in my mind. I’ll confirm it from this blog page. I hope you had a great night following the fantistic win at the football lastnight!!!! Please can you help, I am flying into Malaga Airport Sun 06/07/08 and arrive approx 11.20 & from there I am taking the bus to Marbella Bus station, can you please let me know what bus (if any available) I will need to get to the Las Chapas Hotel… I have looked everywhere I can and have the Bus times as far as Marbella Bus station but can’t get anything from there. If this isn’t too much of a long ride & no buses are available would you suggest a Taxis ride. Many thanks for your help in anticipation. Hi Vallery, really sorry to delay replying to you and then doing it in a rush. I think your best bet is to do one day tours with organised groups. I suggest phoning Viajes Valemar in the main street of Marbella, they are on 952 82 99 44 and speak to any of the very pleasant team of women there and they will sort you out with day trips by bus to any or all of Cordoba, Gibraltar, Sevilla and Granada. Pick up is at determined spots along the Costa del Sol and they can tell you exactly where to be to take your excursion coach. I’ll be back in the office on Sunday evening so if you haven’t travelled by then, will be very happy to help you further. My husband and I are hooking up with my father in Marbella. We’ll be staying at the Royal Aloha Vacation CLub and don’t really want the hassle of driving and/or car rental. We’d like a tour of Seville and see it’s about 3 hours via train. Eeek. Also want to see Cordoba, probably Gibraltar and the upland country too. Any suggestion on professional driving companies??? Rates? Your thoughts on tour companies, etc?? Thanks for writing in to gomarbella and for your kind comments! With six people travelling you would need to take two taxis at any time. The maximum number of passengers is four in a taxi. The current fare (March 2008) is around 90 euros from Malaga airport to Marriots Playa Andaluza but please check this before loading your suitcases. I would be tempted to take the excellent Malaga airport to Marbella bus station shuttle service. If your arrival time works in with the bus departures times then you will save a lot of money. Check the shuttle bus service times at https://www.gomarbella.com/book-your-bus-ticket-from-malaga-airport-to-marbella-bus-station/. Each passenger currently pays 8 euros. With all the money saved on the airport bus you could then take two taxis from Marbella bus station to Marriots Playa Andaluza, arrive in style and not feel the cost. It would also be possible to change buses at Marbella and then bus on to San Pedro de Alcantara and taxi from there but if the group is tired of travelling and you have to wait again for your next connection, it won’t be worth the small saving. The Marriots Playa Andaluza complex is difficult to find the first time so first time arrival in a taxi is advised. Later when you are settled in, you can walk back up to the main road and check out the bus stops for future travel. The road traffic is fast and lethal at all times on the Costa del Sol so do always use the overhead pedestrian bridges for any road crossings. You will be using the Marbella/San Pedro to Estepona bus schedule which you will also find on the bus page link above. The sun is shining brightly as I write this, I hope you have a great journey tomorrow! I am travelling with my family (total 6) to Marriott Playa Andaluza on Tuesday. Please can you advise us on the best way to get to the hotel from Malaga airport. Hi Sally, thanks for writing in, I am glad the info helped. The train from Malaga centre to the airport is a very quick run and there are two trains every hour. You could then have a wait for the Malaga airport to Marbella bus service, there are less buses in winter. That would get you to Marbella and then you could take a local bus to San Pedro. I think if you were very lucky with connections it would take you just a little less time but most probably longer. I phoned the taxi company this evening to check the price of a taxi from San Pedro de Alcántara to Fuengirola. It is €40. (during the day) A taxi will take 30 minutes for this stretch and then the train from Fuengirola station to the very centre of Malaga will take 45 minutes. With the right timing for your connection in Fuengirola you could save 30 minutes. But it would have cost €40 for the taxi plus a couple of euros for the train. That all makes the bus from San Pedro bus station to the Malaga bus station a little more attractive wouldn’t you say? Take a mag and some water and do some people watching and the journey will go very quickly. Yes, there is a normal bus service at Easter, more people might be travelling in the evening to see the processions. The train would get you into and out of Malaga centre though avoiding traffic hold ups caused by the multiple processions taking place in the later afternoon. Thursday evening is the famed Spanish Legionaires procession. What about bussing up to Malaga during the morning or afternoon on Thursday or Friday and then taking one of the last trains out back to Fuengirola and then treating yourself to a taxi home? I hope this helps and that you have a great trip to Málaga. Thanks very much for writing in to gomarbella. I would take the Malaga airport to Marbella shuttle bus. Check here for the winter departures from Malaga airport. https://www.gomarbella.com/book-your-bus-ticket-from-malaga-airport-to-marbella-bus-station/ It looks like you will be catching the 12.00 bus if you arrive at 10.00am, by the time you get your luggage. Don’t wait outside, have a coffee in the arrivals area and do some people watching. I would take a taxi from the Marbella bus station to Guadalmina. It is not worth catching another bus (which would be the Estepona bus) because it would drop you on the main road at Guadalmina and you would need to haul your suitcase to the villa. I phoned the girl at the Marbella radio taxi office 95 277 44 88 and she said a taxi from Marbella bus station to San Pedro would be about €16. She couldn’t give me a price to the Guadalmina commercial centre but said it would only be couple of euros more. All the taxis have got GPS fitted so if you give the street address of your villa to the driver, he will take you straight there. I hope you have a great stay and don’t hesitate to ask if I can help further.